I know heading into my fifth month of insomnia is inevitably making me more vapid than previously suspected. And, while clarity has never proven my strong suit - I can sometimes arrive within its vicinity after endless annoying exercises in deduction. I'm a cloudy soul. And insomnia really doesn't help clear the air - it makes me dumb, irritated, pinch-faced, and suspicious that melatonin is really just this year's Airborne cold-remedy lawsuit fiasco. Who can I sue for my sleep deprivation anyway? So, a dear friend and co-worker queried via email "what is your idea of perfect happiness?" - and - after letting that cement-block question root around in my sleepless brain for awhile, with various contenders rising to the surface for consideration, the answer that eventually won out was "the absence of desire". WHAT? Who am I, Buddha? This, after years of therapy? The equivalent of an "off switch" was the best I could come up with? So, I found the sharp corner of my desk and banged my shin on it and then bit my lip. Felt better. I mean really - I was so freakin' tired yesterday at work, here were my thoughts almost in their entirety: "I want my pillow, I want my sofa, I want to be home, I want my eyes closed, I want to be horizontal, I want no people talking, I want want want want..." - want! So, hindsight informs me where the desire for the absence of desire was coming from, I suppose. Because truly, all I've ever really wanted in life is clarity about what I want in life. So, given the question has haunted me and my shin ever since - I would now like to revise my answer before it lends itself to exponential insomnia. My idea of perfect happiness is clarity about that which fulfills me - plus - I fully believe that desserts should be damn free of all damn calories. PERFECTION. Well, this was indeed a pesky little project. I initially decided to go off the reservation and try a new recipe for the tartlet - I mean, I like to live on the edge over here. So, I baked the tartlet and was colossally disappointed (yet, this crust had great online reviews, grr). Why isn't Snopes all over this one? So, I then decided (knowing I had to also consider the waning photo-shoot light) to go with a shortbread I already trusted, from the one-and-only saucy little minx - Ina Garten. Then, I wanted to top these suckers with truffle - that's right - just plain old homemade truffle. So I did. And, I liked it - but, I wasn't hot and bothered about it. Though, I definitely would make that combo again for a party (let me know if you want the truffle recipe). BUT *finally*, I made a mocha frosting - and we were all "oh...oh, yeah baby". And this dang recipe was done. Preheat oven to 350 degrees. Equipment needed: mini-muffin pan, ungreased. 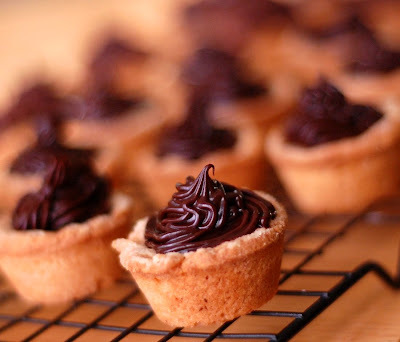 Tartlets: beat the butter and granulated sugar until light, about 3 minutes. Add eggs and vanilla, mix well. Sift together flour, baking powder, and salt. Mix dry ingredients into butter mixture until just combined. Dough will be sticky, have bowl of flour nearby to coat fingers while working with dough. Form 3/4-inch balls of dough and press into muffin tins and up the sides. The perfect piece of equipment I found for this was a mini-liquor bottle dipped in flour, perfect size! Don't be tempted to make the balls larger or the end result will be tartlets that are too puffy and large. 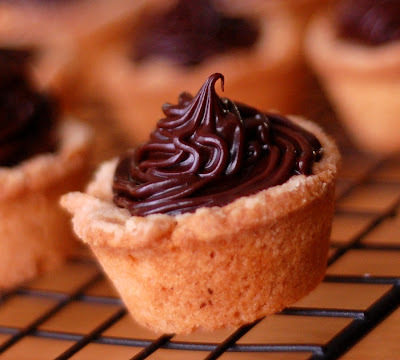 Be sure that the bottom of the tartlet is quite thin. Bake for 13-15 minutes, until edges just start to turn golden. Cool on rack. Any leftover dough freezes wonderfully. I made 24 and still had a bit of leftover dough. Frosting: Beat ingredients in medium bowl with electric mixer on low until frosting is smooth. Use immediately or place in refrigerator if stiffening is needed. Frost shortbread with knife, spoon, or use pastry bag. Enjoy. Shouldn't these be calorie free? I just really think so. Dear friend, what can I say? You so eloquently express ME I ask myself why I should even bother to speak anymore. When people ask, how are you?, I can simply refer them to your blog! “I’m a cloudy soul”—wow!—from what deep wells of self-knowledge— and, perhaps, heretofore unrecognized clarity—do these poetic turns of phrase come from? Thank you for your pearls of wisdom wrapped up so beautifully in killer humor, which brings it all home quite nicely. That chocolate looks amazing, with those small peaks. I couldn't agree more with calorie free desserts adding to perfect happiness. Enjoyed this post. Those look wonderful. I am a new reader. About your insomnia, I have fibromyalgia, and sleep is an issue with me,I have been using a CD by Dr. Jeffery Thompson. He uses sound frequency patterns to induce brainwave entrainment. It has been helping. Google him and look at some of his CD's. oh, ina. we were meant to be together. i don't know what you're talking about with the calorie-free thing. i'm pretty sure that picture caused me to gain some weight. Hi Michelle - LOL - Ina love is rampant. Also, will have to figure out how to make low-cal pics! 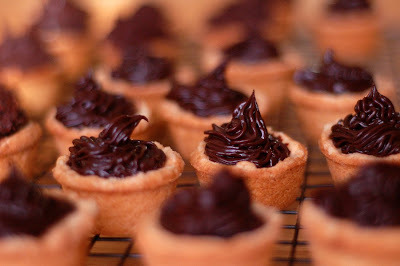 Oh, I am so making these little treats. They look divine...and just decadent! Nice to have found your blog. Hi Diva - Thanks! They were small...but you're right...they just kept landing in our mouths, oops. I love your idea of perfect happiness, with a calorie-free tartlet thrown in. Your photo looks awesome. In a roundabout way, you've hit upon something I've concluded decades ago. Within the human structure, there is a serious design flaw: the lack of contentment. We always want more, something else ... rare are the moments that we aren't wanting something. I go through the type of insomnia you describe from time to time. (Sleep issues since birth.) Totally sympathize with your frustration. Wish I had some good remedy to offer. This is quickly becoming one of my favorite places to visit and it's not just the amazing pictures and recipes! Love your thoughts and insight. They were especially helpful today! Thanks! dearest Ann, I don't really know what to say. how you find the courage to see perfection in a calorie free dessert while I would -handsdown- choose a bed. but thinking about it, I wouldn't mind sampling one of those moccha beauties from my bed (or sofa, you choose, I'm not picky). hi, i'm a new reader, this recipe is wonderful. Please, can i have the truffle recipe? I like very much this blog. thank you! Fanny - I think I like your idea of dessert *and* the bed, brilliant!!! THis is why I should never surf this blog on an empty stomach.